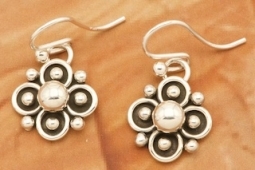 Sterling Silver Shepard Hook Earrings with a Pretty Clover Design. Created by Navajo Artist Artie Yellowhorse. Signed by the artist. French Wire Earrings are 3/4" L x 5/8" W.